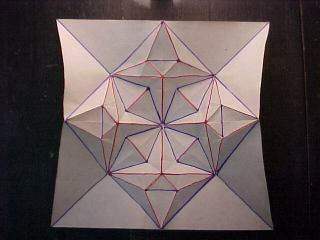 This is the crease pattern for the figure in Page 127 for Robert Harbins book. This view is from the reverse side to that shown in the book (ie: coloured side is down). Red lines are Mountain Folds and Blue Lines are Valley Folds.